The other school morning my 6 year old daughter who is in Kindergarten got up with me around 5:30 AM . I am in the kitchen getting the coffee going and I typically read for a few minutes to get going in the AM . Ruby walks in the living room without saying a word and goes and gets her Kindle Fire tablet and her headphones and sits on the couch. Not a "Good morning Daddy", nothing, just wakes up,gets her device and sits on the couch and stares at the screen. I immediately think, "well great!, parent fail, we're having too much screen time and she's addicted to the screen and she is 6. Am I modeling this behavior for her? ". Just to put myself a little more over the edge I say Good morning and then I inquire about what she is watching. Her device has parent controls enabled so she can play kid games, and watch kid videos etc. . . so, anyhow, to put me over the edge a little more she is watching a Youtube Kids video of girls her age playing with Barbies in a Barbie House. Because I can't help myself at this point and the steam from my ears looks like a Tom and Jerry Cartoon I take my coffee and I walk into the next room to view the giant Barbie Dream house that Santa got her for Christmas. "Ruby, you know you have this right. Right? It probably took Santa a long time to put this together then read the directions and then undo it then fix it the right way. Right?" "Hey Rube take off your headphones I'm talking to you, you know you have all of this right?" I mean, I'm pretty livid and I try really hard to not be livid. Finally I get a response, she takes off her headphones and said very sweetly "Yeah dad, but I'm learning how to use it" Wow. A really double edged sword now. So I'm thinking "Well, on one hand, she is seeking out the information herself. She is engaging in a new way to find information for something that she is curious about. That's pretty good" on the other hand, "Why should you be watching other kids play with barbies without saying good morning to your dad at 5:30 AM? Why are you even up at 5:30 and why did you get your tablet out?" So the talk we are going to have is this. We are going to be purposeful about our technology in the winter household. Me included, the rest of my family included. I want to be a better model of using technology purposefully. I think that Spring break is going to be a good time for us all in my family to unplug. Also a time To think about when are we using technology. Why are we using technology? 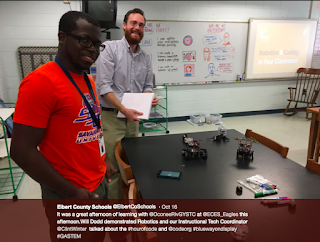 Then that made me start to think about our students here in Elbert County and their devices. Are we purposeful in how we use them? Phones, 1:1 devices, etc. I am so proud of the High School for having this discussion right now. I really truly believe that technology is part of life now. It is. I get it. . . It's part of life, it's part of business, its part of education. It allows us to do things that we have never done before! I was communicating with an educator in Iceland yesterday! Iceland. I know it is something we do all the time now but let us really think about how this removes the walls of the classroom. I was in Elementary school in the early to mid 80's. There is no way I would have the opportunity to talk to someone in Iceland. True story, the closest I came to this was in 2nd grade when we wrote letters tied them to balloons and went outside and let them go hoping someone would get it and read our book and get back to us.I was really really bummed when I never heard anything back from balloon. What a great learning experience it would be if we could have our students collaborate with students in Iceland and have a more global view and discussion about book, problems, projects, and lessons. But, does that mean they have to have their phones or chromebooks, etc. . out all the time and stayed glued to their screen? Probably not. We live in a tech society but I strongly believe that we need to teach our students how to be purosable about how they use it. I tend to put my phone away when I get home in the evenings. People tend to think I am off the grid if I don't respond immediately. I am kinda old school in that I would rather talk than text. I try to unplug throughout my day, but society now considers you a Grinch if you are not readily available. If anything, I have been drug back down the Facebook hole. I could definitely limit the time I spend there. Here's to a restful Spring Break.